Spillpak covers all spill protection needs. FARNELL InOne has released the Small Mobile Spillpak from Opec Systems - a portable, compact kit to cover a range of spill protection requirements. Housed in a weatherproof wheelable container, the kit can be located immediately adjacent to potential spill areas - either inside or outside. The kit has the capacity to absorb 100 – 120L (other sizes are available). 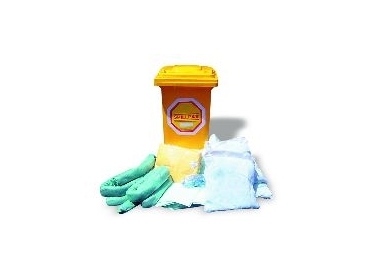 The Spillpack is suitable for maintenance, oil and chemical spills. The Maintenance Kit contains general purpose sorbent materials for the clean-up of most liquids used in factories and workshops. The Chemical Kit is ideal for the clean-up of hazardous and aggressive liquids. It is suitable for virtually all chemical types. The Oil Only kit is designed for the clean-up of oils, fuels and other non-water soluble liquids. The sorbents for this kit can also float on water. Each type of kit has different colour coded sorbents to ensure the right product is used every time. Kits contain three socks, 50 pads, three pillows, one pair of coveralls, one pair of gloves, one pair of safety goggles, three disposable bags and ties, audit sheet and instructions for use. Kits can also be customised to suit clients' specific spill control needs.